A new book by George Marshall, author of Get Out While You Can - Escape The Rat Race. A journey through the back streets of economics and history to arrive at a startling conclusion. It's time for you to down tools and become a capitalist. 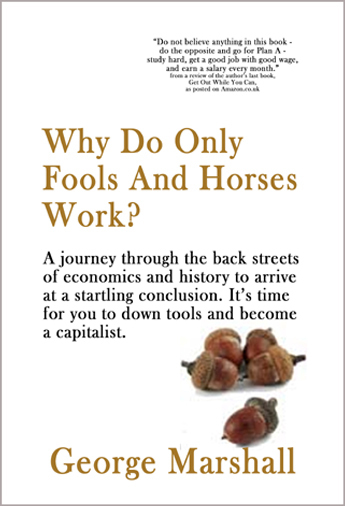 To be told when the book is available, email info@entrepreneur.co.uk and put "Fools And Horses book" in the subject. You can find out more about George at his blog. Why is this book so late? Why Do Only Fools And Horses Work? seems to have had more release dates than your average prison wing. This is completely my fault, as the author and publisher, so many apologies for the changing publication dates. "Do not believe anything in this book - do the opposite and go for Plan A." This really surprised me. As in REALLY surprised me. Plan A. Work hard at school, secure a good job, set your sights on promotion, climb the corporate ladder, live happily ever after. Reality check for Plan A. Work longer and longer hours just to make ends meet, being condemned to a life of wage slavery, drowning in sea of debt, the poverty of mind and spirit, existing to work. In Get Out While You Can, I presented an alternative, my Plan B, which gave an introduction to how I (like many others) have carved out a way of making money online. What struck me wasn't that the reviewer was questioning my honesty (comes with the territory! ), but that he could see no alternative to Plan A. As if we were put on this planet for one purpose and one purpose only: to work "for a living". I wanted to know why so many of us accept that for 40 or more years of our lives we have no choice, but to work, even if that work fills us with dread each and every working day. The more I thought about this, and the more I read, the more I came to what for me was a startling conclusion: it's time to down tools and become a capitalist. That's not something I thought I would ever say or believe. I was born in Ruchazie, Glasgow, and am from a working class family. Writing Why Do Only Fools And Horses Work? has challenged much of what I held to be true, even while pursuing an alternative to Plan A. At times, it has felt overwhelming, to the point where I have had no choice but to take three steps backwards so that I could take one sure foot forwards into what, for me, was new territory. It has consumed so much of my time that other projects have been put on hold, but that just emphasises how important I believe this book to be. It is now very close to being finished and will be published in October. I genuinely believe it will be worth the wait.